Yet 2011, ten years after the book’s publication, saw the demolition of the ‘Second Frontier‘ that separates the rural area and the Special Economic Zone (SEZ), marking the loss of Shenzhen’s special identity and the start of its normalised urbanisation. The freedom of developers, planners and architects, all working at a feverish pace to create new cities, and the consequential low cost, extensive mega-plot developments caused the biggest problem of Shenzhen’s future development: land shortage. Meanwhile, these ten years also saw the rise of a new class of workforce and consumers, on which the market economy depends. Yet the participation in free trade did not guarantee personal freedom. The mobility of capital did not mean the mobility of the individual. A decade after the publication, an increasing demand for personal freedom by a floating population of labourers started to contradict the forces of global capitalism and modernisation celebrated in the book. It further challenged the mega-plot model that prioritised the market over public infrastructure. 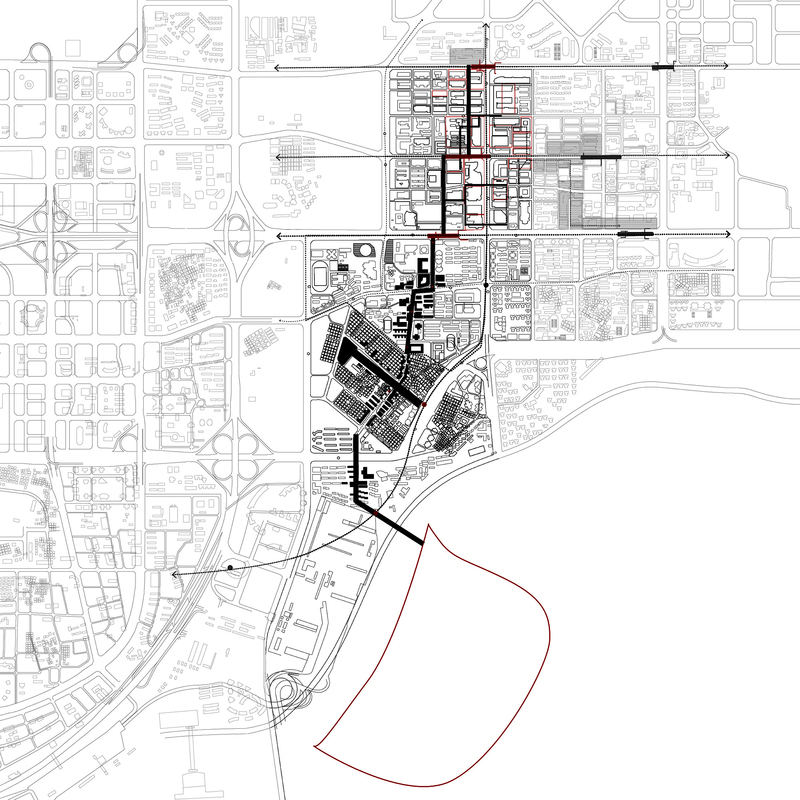 It is in this context, that this dissertation proposal attempts to rethink the relationship between planning, commercial development and the provision of social welfare, and to discuss a potential new urban development. Instead of accepting the forces of marketisation as given and ignoring the risks of abuse inherent in mobile capital and short-term interests, the research aims to search for a re-regulation that empowers the neglected labour force behind this economy and envision a different future growth of the city. The relationship between commercial development and social welfare, especially educational provision, will be rethought in the terms of public infrastructure, as an alternative approach to the mega-plot in the city’s densification and regeneration. Between 1980s to 2000s, the effect of the SEZ formed an industrial chain within the region of the Pearl River Delta, with Hong Kong being the main driver providing an advanced administration model and technology, which were eventually introduced to Shenzhen. As the gateway to the mainland, Shenzhen relocated its production industries to adjacent cities. From 2000, this condition started to change when economic differences between Mainland China and Hong Kong became less distinct. Shenzhen’s role as a border and experimental zone diminished. At the same time, with China’s preferential policy for the Yangtze River Delta Economic zone, stress started to occur in Hong Kong’s economic transformation. Meaning a demise in the financial industry, and the lack of a production base that could be transformed into a viable knowledge economy. On the other hand, during its thirty years of urbanisation, Shenzhen established a solid base for a growing knowledge industry, forming regional bonds with Dongguan, Huizhou and Shanwei to establish a strong regional industrial centre. 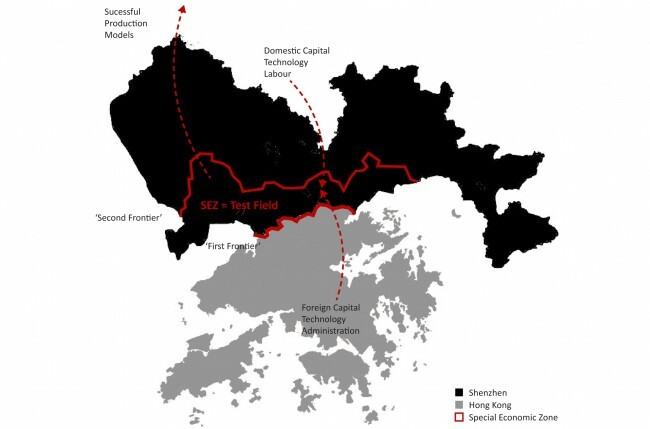 Accordingly, plans for a Hong Kong – Shenzhen Metropolis in 2007 suggests a new hierarchy emerging in the Pearl River Delta, with Shenzhen being the potential new regional leader of industry and development. 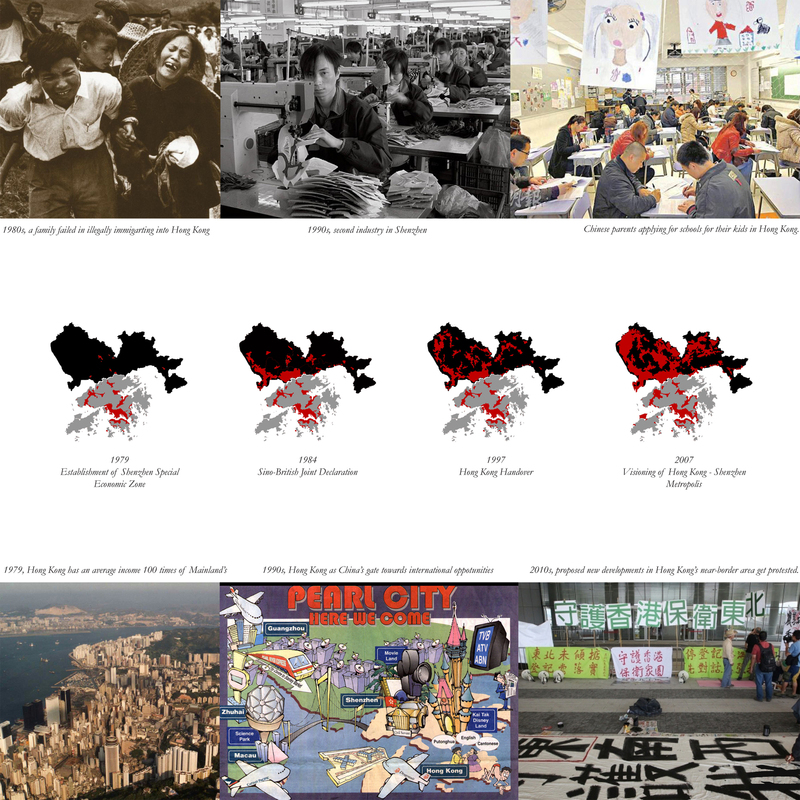 Left: While the economic gap between mainland China and Hong Kong narrows, a difference in the level of development still exist, especially in the provision of social welfare. Each day, 16,000 school children from Shenzhen commute to Hong Kong. 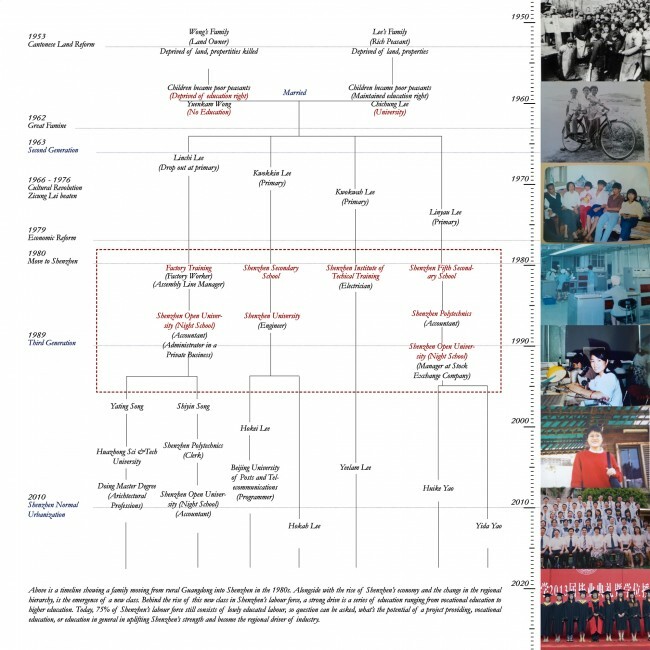 These trans-boundary school children have Chinese parents that gave birth in Hong Kong in order to obtain its citizenship and right to welfare. Each year, 30,000 women from mainland China give birth in Hong Kong. Right: This has resulted in a recent increase of development in the New Territories of Hong Kong, near the border to Shenzhen. Developers purchase agricultural land to develop new communities with schools, hospitals and housing, which has led to continued protest by Hong Kong citizens. In order to improve its advantages, Shenzhen needs to strengthen the cooperation with Hong Kong in high-end manufacturing, hi-tech industries and modern service industries. In recent years, several cooperation projects have been developed between the two cities, The Qianhai Cooperation Economic Zone and the Lok Ma Chau Loop Education and Industrial centre. Nevertheless, within the cooperation of the two cities, two fundamental problems but also potentials are hindering Shenzhen’s development. On the one hand, in 2012, the shortage of human resources in Shenzhen was 830,000, with a shortage of 300,000 highly skilled workers. Less than 30% of the current labour has vocational skills above primary level. Immigrant workers make up 75% of the working population, but their education level is relatively low, with 70% having an education below secondary level. The education level of the current labour force hinders the transformation of a secondary to a tertiary economy. But unlike using the Hukou System as a way of controlling labour mobility in other parts of China, The Shenzhen 2030 City Development Strategy proposes a new scoring system that calculates the worker’s educational level, which if high enough gives them conditionally an urban Hukou and thus rights to social welfare and state provisions. The government also carried out a plan in 2012 to provide compulsory vocational education for all workers, with a minimum of 250 hours per person per year for migrant workers. On the other hand, low cost land, low tax rates, cheap labour, external funding and technology support were the main drivers for Shenzhen’s rapid development from the 1980s to the 2000s. This low cost expansion, mainly in the form of the mega-plot, has now become a burden to its development. According to the Land Use Planning of Shenzhen 2009-2020, Shenzhen has used 94% of its total constructible land. The Shenzhen General Plan of the Reform of Land Administration System of 2012, the third land reform in Shenzhen, states that three dimensional land right (ground, underground, above ground) is the basis of the reform. 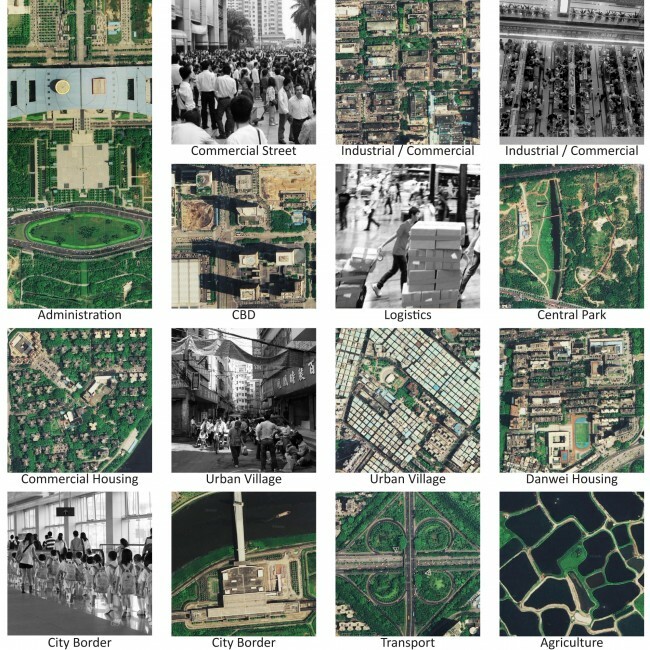 This means that the old model of large-scale parcellations served by widely spaced infrastructure, within which speculative developers produce freestanding buildings and minimum infrastructure, has to be rethought. More infrastructures at different scales and serving different stakeholders are necessary to provide new types of densification and redevelopment. Huaqiang North Industrial Zone in 1980 is a typical example of a mega-plot developed by real estate speculation: free standing buildings served by minimum infrastructure. This is now changing due to the need to densify and intensify commercial activities. Developers purchased buildings in the mega-plot to obtain development rights, resulting in the further parcellation of development and management units. The Shenzhen General Plan of the Reform of Land Administration System of 2012 suggests that the development right of the Huaqiang North area should be devided three-dimensionally. Around the Huaqiang North area. Although the gated parcels are starting to transform because of densification, the different themes and spatial qualities of each parcel still exist. Thus the problem is twofold, a multi-scalar urban renewal and densification, and an upgrading of the labour force through provision of social welfare, especially through education. Thus we have to better understand the relations of (vocational) education, social welfare and infrastructure in today’s socio-economic context. Why and how can vocational education – or education in general -, social welfare and infrastructure be conceived together? This especially in the context of a new knowledge economy and today’s socio-economy with conflicts starting to arise caused by a negative impact of global capitalism? How can infrastructure become a strategy to conceptualize urban space? What is the potential of transport-oriented development as a form of urban management that brings together different stakeholders and scales of developments? 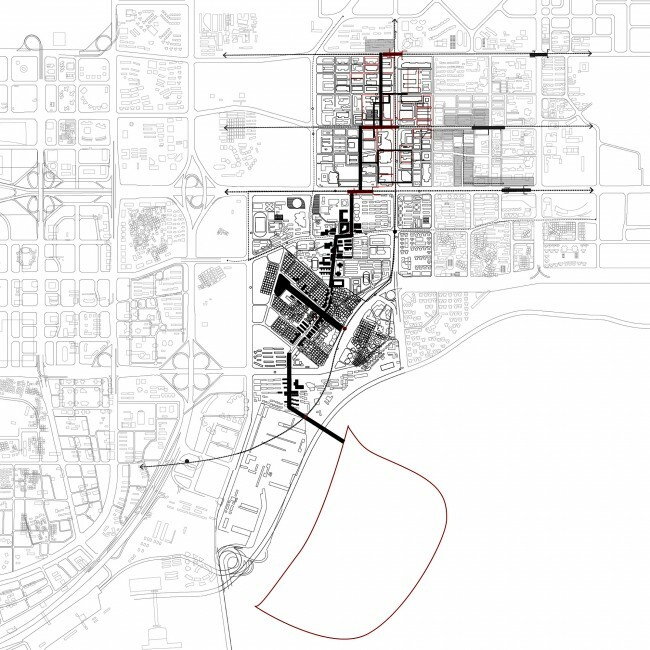 How will can a linear university architecture provide typological diagrams of knowledge distribution that can help to shape an urban knowledge infrastructure?